A Norwegian family arrived at their cabin in Oslo recently to discover that a meteorite had apparently fallen through their roof, according to media reports. The Thomassen family discovered a hole in the cabin's roof and a stone nearby that turned out to be a meteorite, after visiting the holiday cabin for the first time all winter, Views and News from Norway reported on Monday (March 12). The rock may have fallen during a wave of meteor sightings over Norway on March 1, University of Oslo astrophysicist Knut Jørgen Røed Ødegaard suggested. "We took in hundreds of tips and have been searching for bits of meteorites,” Ødegaard told Norwegian paper VG Nett after examining the Thomassen's discovery at their cabin. "And then we find this right here in Oslo!" 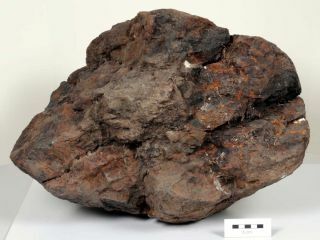 Ødegaard reportedly identified the rock as a rare type of breccia meteorite, which is a conglomerate of smaller fragments of minerals. The 1.3 pound (585 gram) stone was found split in two, AFP reported. "This family is very lucky," Serge Koutchmy, a researcher at the Paris Astrophysical Institute, told AFP. "First off because the piece of meteorite did not cause much damage, but also because it is worth a small fortune." Space rocks rarely fall in populated areas, and such a find in Norway is exceedingly special. According to Views and News from Norway, only 14 meteorites have been found in the Scandinavian country since 1848.